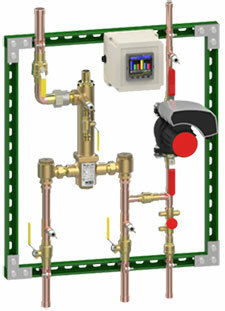 Lawler's NEW MINI Manifold Deluxe Pre-Piped Recirculation Systems offer engineers a pre-piped solution with local and remote digital temperature monitoring. The unit features a small ("mini") footprint – just a few inches larger than a standard valve in a cabinet. Lawler's patented 800 Series High-Low Master Controllers increase the performance and cost effectiveness of this mini pre-piped system by controlling both high and low flows while providing Three-Way ProtectionTM. Lawler's Mini Deluxe Recirculation System is a turnkey unit that includes Lawler's patented single valve high-low technology as well as integrated smart pump technology that helps improve balancing of the recirculation loop. The system also includes thermometers, ball valves, mounting strut and a test connection. This deluxe, complete solution is a part of Lawler's Power of OneTM pre-piped, pre-packaged, pre-tested systems, intended to give you one point of design and one point of accountability.